Comex raised GOLD PRICE futures margins today from $4,675 initial and $4,250 maintenance to $4,950 and $4,500. This is usual as the gold price rises. SILVER ebbed 12.7¢ to $15.165 on Comex. The GOLD PRICE lost — wait for it! — fifty cents to end at $1,238.20. This picture is all fuzzy. Wind must have blown down my antenna. Can’t quite get silver and gold prices to focus in sharply. After its $9 collapse in yesterday’s aftermarket, the price of gold rose to $1,244.40 at today’s high, made a slightly lower low ($1221.80 against $1,222.40), then ended the day virtually unchanged. It altered the appearance of that pennant into a possible Bearish Flag instead. Behold the chart on the right. All this whispers darkly of lower prices. More, the Comex closing GOLD/SILVER RATIO rose today to 81.649, bumping the trading channel’s top boundary. That strongly implies that the gold price will drop relative to silver. But Thunderation! 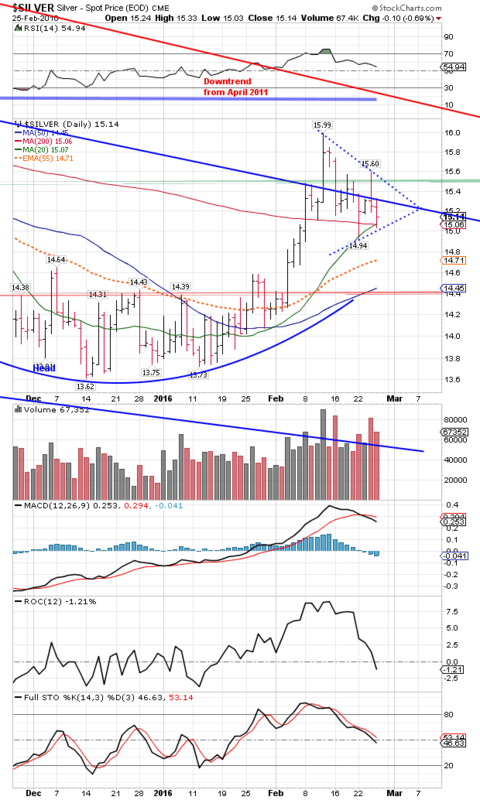 Look at the SILVER PRICE, It bumped its 200 DMA today, exactly at the same location as the 20 DMA ($15.06 and $15.07) and has formed an even-sided triangle which could just as easily resolve skyward as earthward. I am torn because I wanted to buy more silver somewhere under 1510¢ and missed it today when it hit 1503¢. I’m not acting coy, the pros and cons are just too evenly balanced. Commitments of Traders for silver are lousy, so that’s against it. Here’s where I hang. 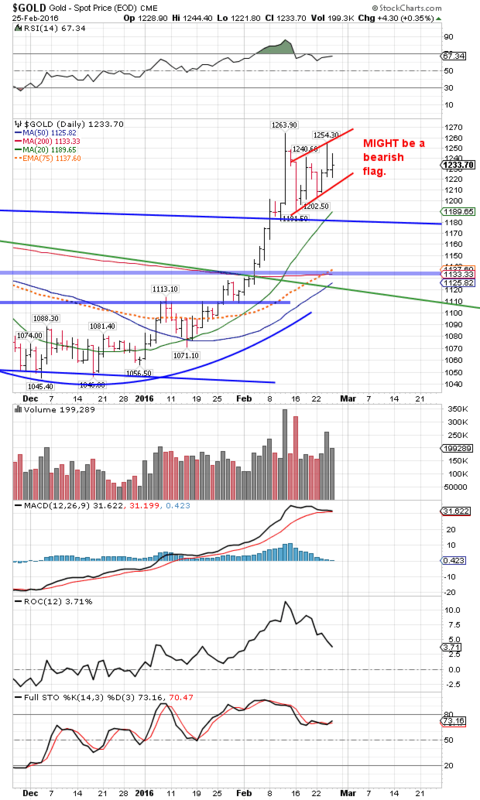 Gold closing above $1,264 would drag gold substantially higher, say, to $1,300 – $1,395. Otherwise look for one more scary leg down that cracks $1,200 and plunges swiftly to $1,180/$1,170 then snaps right back. For now that’s the clearest picture I can get., although I’ve ’bout twisted the knobs off. A MARK OF THEIR DESPERATION: Illinois’ state budget and pension fund crisis is the worst in the US, save for California. From a friend who lives across the border in Indiana comes this mark of their desperation. The utility company cut off electricity to the Illinois State Police outposts for failure to pay the bill. My friend also drives an agricultural truck through Illinois and says they are setting up roadside scales, stopping every truck, and ticketing and fining if loads are even 100 lb. over limit. Clearly they are desperate for revenue. But hark! This is only the first buzzard of spring. Most states have budget shortfalls, and many have pension schemes waiting for bankruptcy, they just haven’t declared it yet. Hide and watch. Big POP a-comin’. Behold! The US dollar index reached 97.5 resistance, twice poked its head above, then wilted like Swiss chard in hot olive oil. Today it fell back 13 basis points (0.13%) to 97.39. Maybe the 20 DMA at 97.22 can catch it. It’s pounding into the uptrend line, trying to fall through. Euro remains a mere reactionary shadow of the US dollar. Rose 0.1% to $1.1025. Yen’s rally broke today with a gap that left behind what resembles an island reversal. Dropped 0.63% to 88.58¢/Y100 (Y112.89/US$). Stocks peeked over resistance at 16,600 and 1950 plus their 50 day moving averages. Dow languished most of the day little above unchanged, but at that regular 1:00 hour “friends” began buying and raised the Dow from 16,516 to 16,697.29, up 212.3 (1.29%) at close. S&P500 differed not much, rising 1.13% (21.9 points) to 1,951.70. These closes rose a gnat’s eyebrow about the 50 DMAs (16,600 and 1,945.50). Now let’s see how far stocks can rise against that headwind of resistance. I have no opinion because I wouldn’t buy stocks if I had gummint money to do it, so I have no dog in this fight. Know, however, sure as cats have kittens that stocks will shed value this year like a dog with dermodectic mange sheds fur. Consider the Shanghai stock exchange with an already advanced case of mange. Lost 6.4% today. Susan’s eye has it’s little problems, but is getting better. We’re thankful for every little betterment.